This is actually post script to my last post as I realized that it might be advantageous for me to share my” re-arranging the needles” ritual. 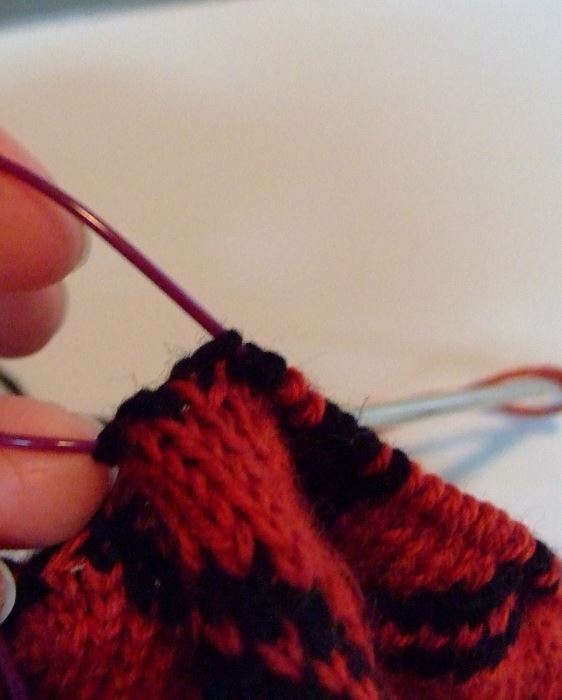 1) Leave yarns lying between the needles. 2) Pull right needle through, allowing stitches to rest on cord. 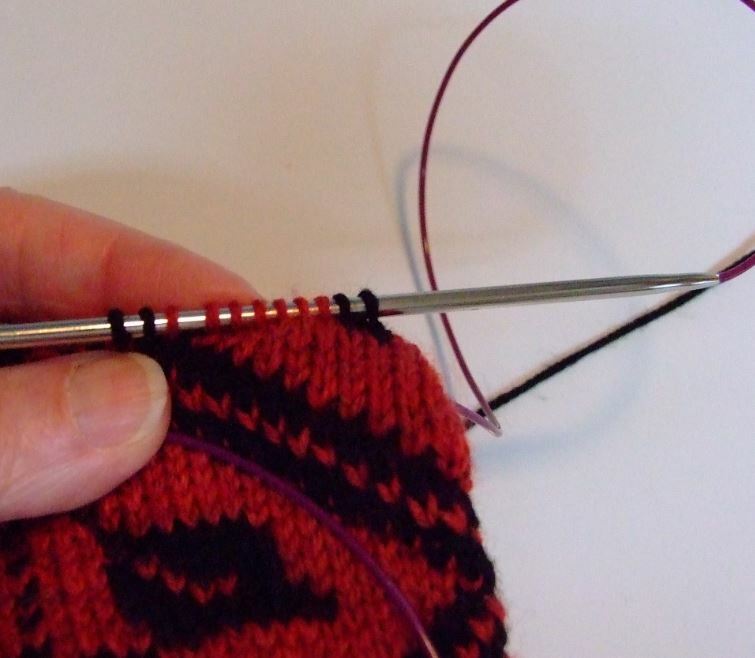 3) Select point of needle exit, usually between the 12-13 stitch, or where the stitches change colors. Pinch needle together to form a small loop between the stitches. 4) Pull the right leg of the cord through to form a loop. Release it. 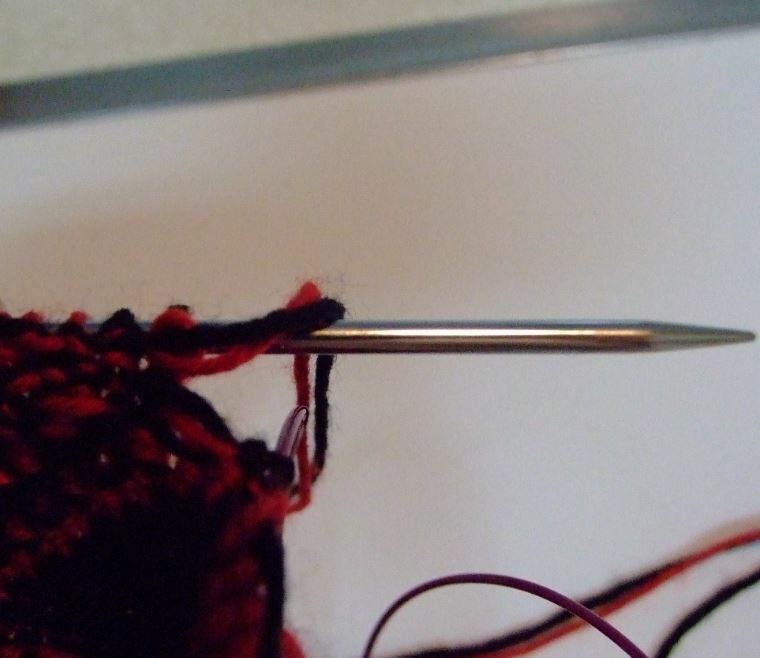 Pull you needle back to the right to allow the chosen stitches to rest on the needle. Turn work counter clockwise. 5) Next, bring both yarn over the top and to the back of the right needle, so they are out of the way. 6) Now it is time to adjust the left needle. As it is already resting on the cord, select the section of the pattern you want to work on, then pinch the cord together at this point and gently pull the cord through to form a loop. 7) As before, you will pull the metal part of the needle through to the left, so that the chosen stitches now rest on the working part of the left needle. 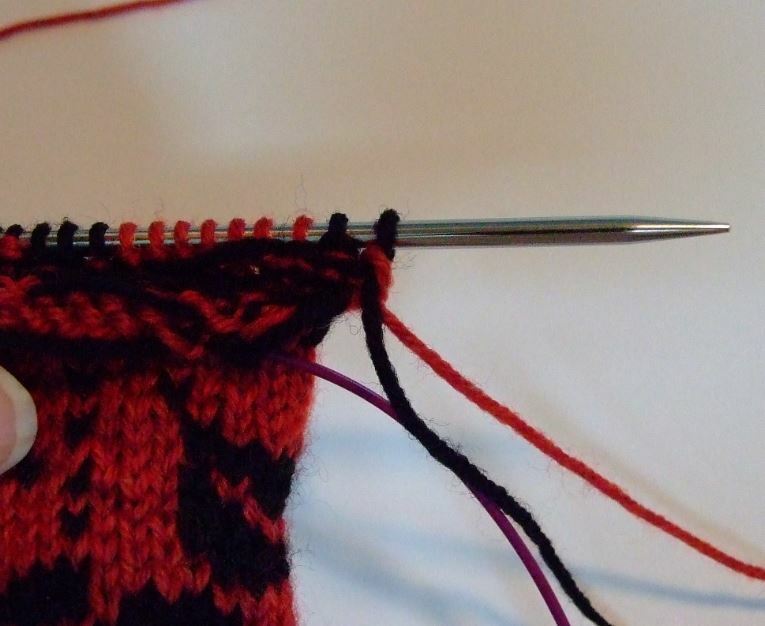 8) Gently push your stitches on both needles into the “go” position. Now you are on your way again. This is my ritual, I am sure you all have your own. I hope it helps! One more thing- I always turn my work clockwise. PS- I uploaded a practice chart on my last post for you to work with. 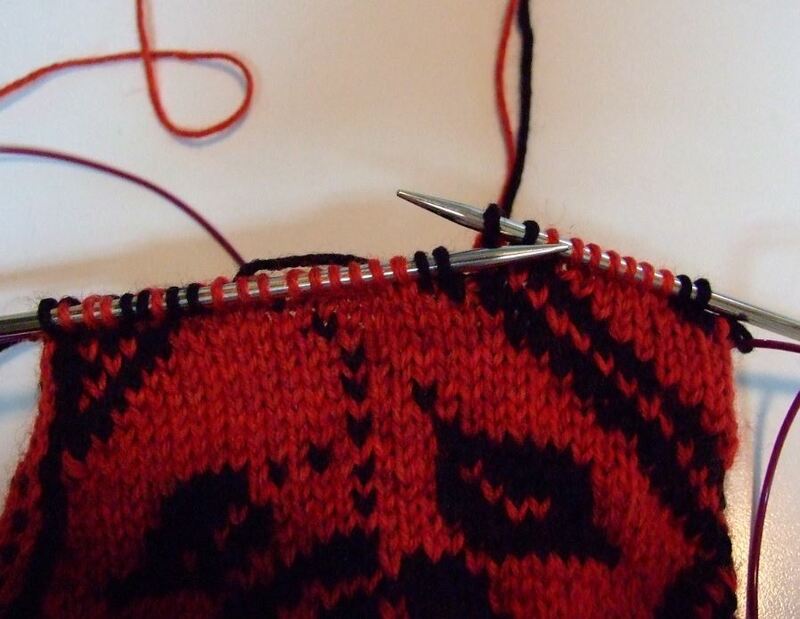 Fair Isle -Short or Long Floats? While working on my Nordic Rose stocking I did a little experimenting. Why? 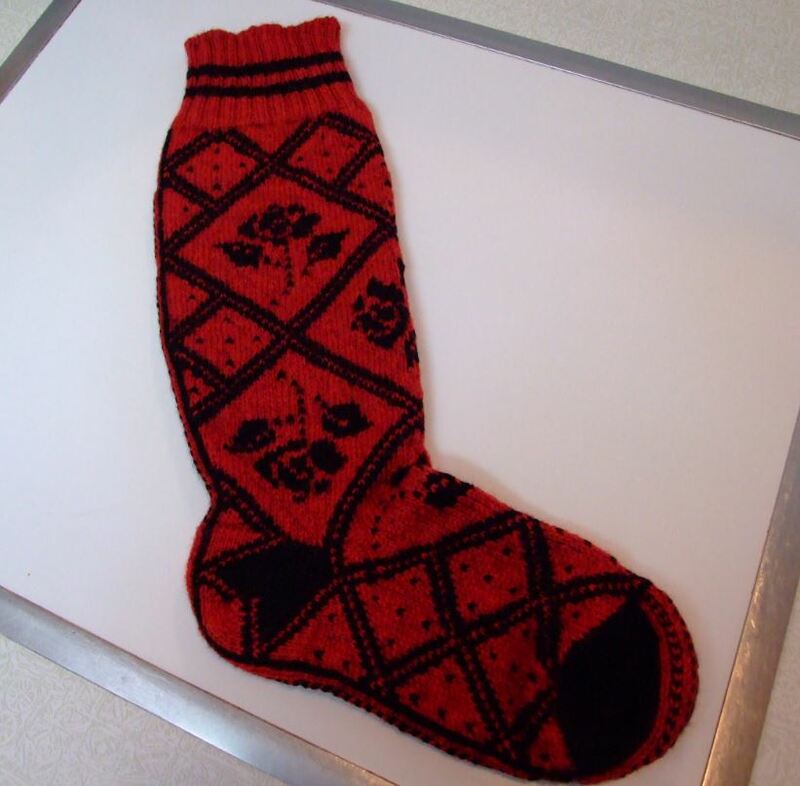 The pattern for this stocking has large areas of one color, and kind of stretches the Fair Isle method to its limits. How to handle this problem became my challenge. The first chart section I constructed using the Fair Isle method with short floats, say at least every 3/4 inch, and established breaks on my one circle needle for NA(needle A-front) and NB(back). The second portion of the chart I changed my needle positions to suit the pattern, allowing me to work across the design portion without any ladders to worry about. I also did not weave in my alternate yarn color as before. The results were stunning. The upper section of the above photo was done in the second method, repositioning the needles as I worked around the chart. 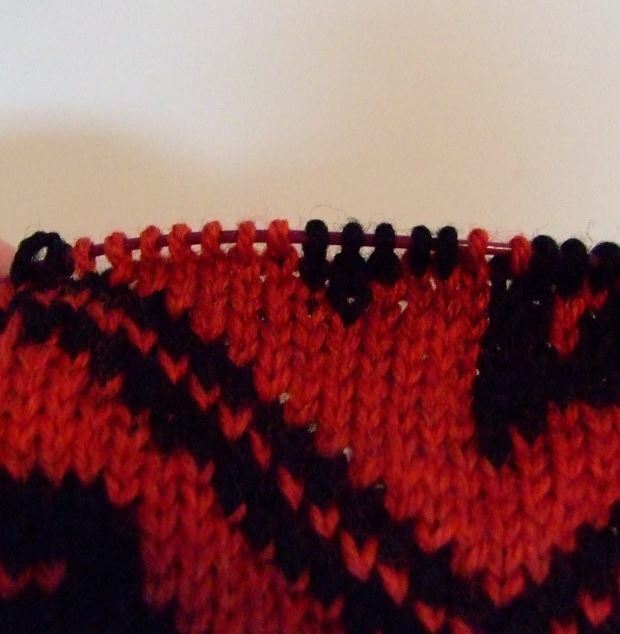 Of course, another benefit of this method is that you yarns don’t get tangled as they remained in the same place all the time(black on the right, red on the left). The lower section of the example where the floats were kept shorter, shows slight dimples( see photo below)in the surface. This happens no matter how loose you leave the float. If you use the second method and leave your float too loose, the stitches at the opposite ends of any section of the color can loosen and affect your gauge. 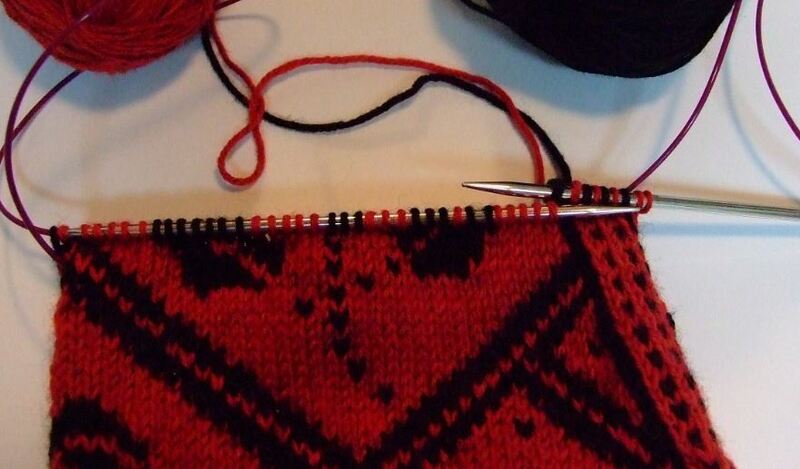 4)complete stitch with main color (red). The next stitch will be the new color (black). Now the float will stay in place and lay horizontally(with no discernible dip) across the back of the red stitches. I always tip the work forward to check the tension of the float before proceeding to the next section. I make sure that everything stretches out equally. Taking the time to do this will save you lots of headaches later. You will notice that the diamond above is very smooth. The long floats on the inside that I deem might pose a problem when sliding on the stocking will be tacked down with a needle and one ply of the background yarn ( in this case, red). The process of moving the needles as I go has eliminated the need to deal with the “ladders” of circle needle knitting. 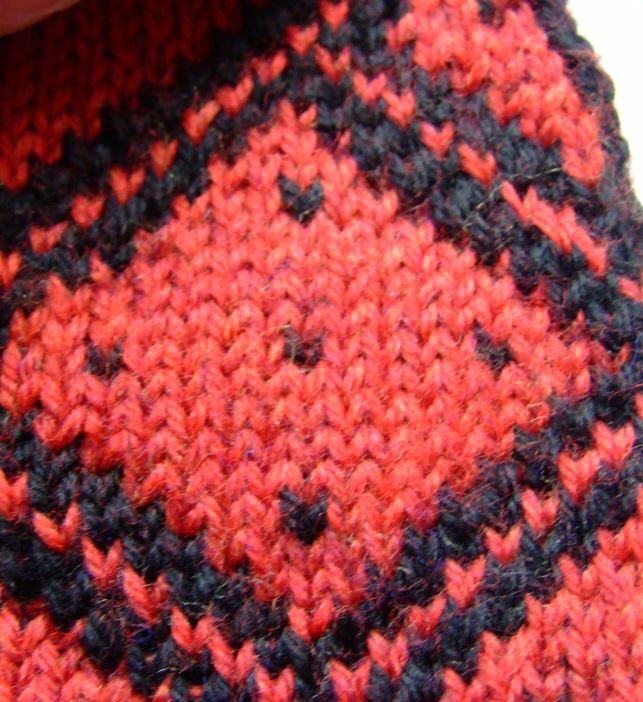 One thing that makes this easy is that this pattern always has a center back pattern, and the last stitch of the round completes the right side border of this section. This lets me know where the round starts without using a marker. Below is a photo of a new needle position, as I retain about 10-12 stitches on my right needle, and prepare the left one to knit across the rose diamond section. It works for me! Give it a try. Below is a practice chart for you to try. 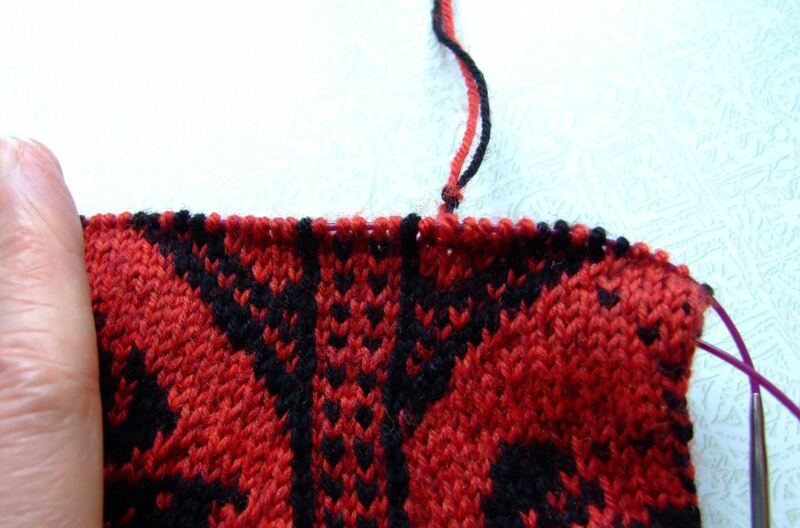 Of course, I could do this pattern in Intarsia, as the center back stitches make an excellent point for a turn around. Hummmmm???? I just finished the first sock of my new pattern. I had originally planned to make the field black and do the roses in red, but these old eyes just couldn’t handle the dark background, so I opted instead to reverse the colors. I like it. 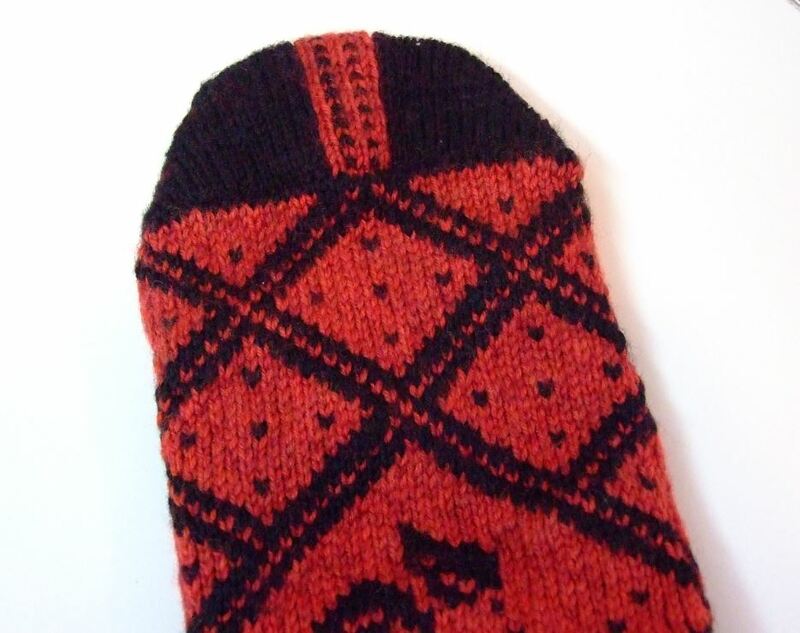 This knee high pattern consists of tubular 2 by 2 cast on, fair isle knit pattern on leg and instep and a double knit heel and toe. I also retained the center stitch down the back, sole and toe. 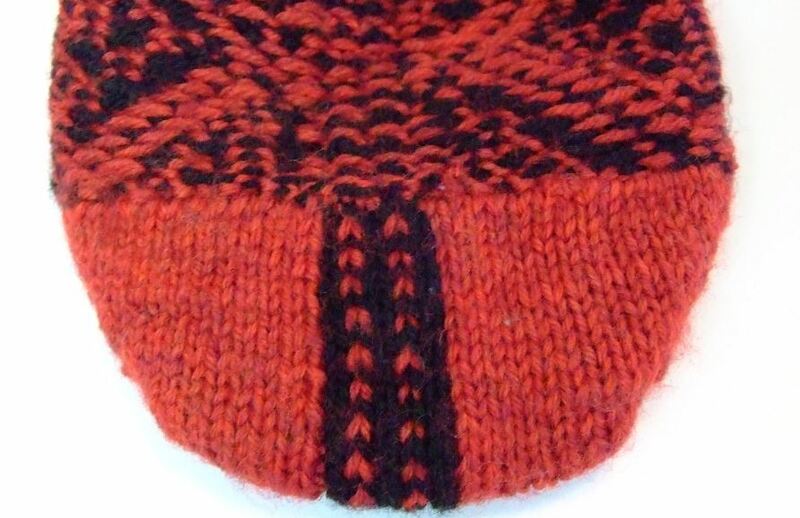 Below is a close up of the right side toe cap. 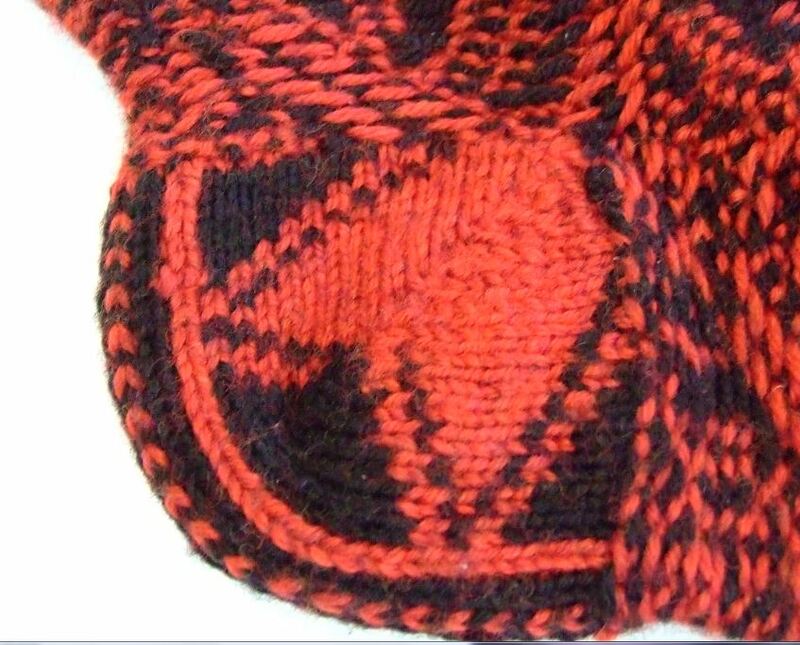 You can see how the reverse center stitches come round to meet the top, where the unit is joined together with the Kitchener stitch. Here is the wrong side view. Here is the inside of the heel. This was definitely an interesting knit. I am at present completing the pattern instructions and will be uploading them soon. The pattern will include several design options for the toe and heel. 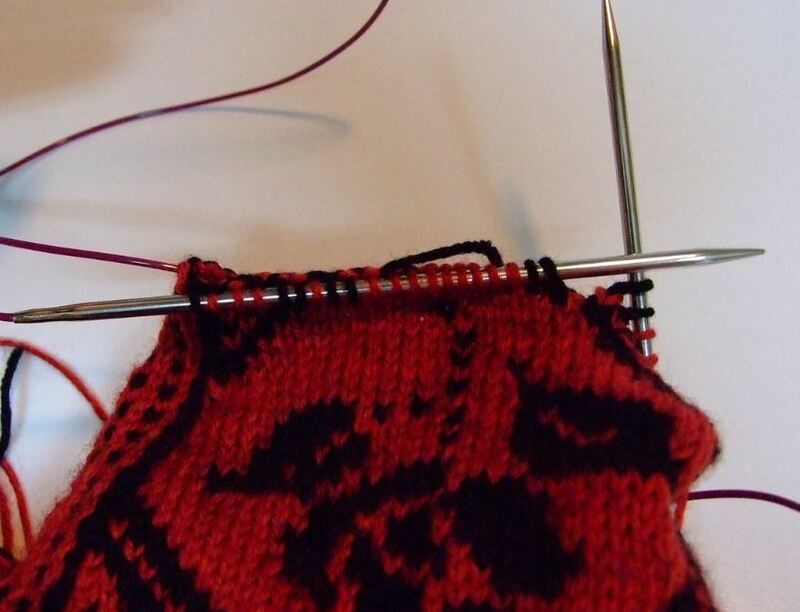 The one thing that stood out to me was the necessity to break you yarns at the conclusion of the last round before setting up for the heel, and toe. 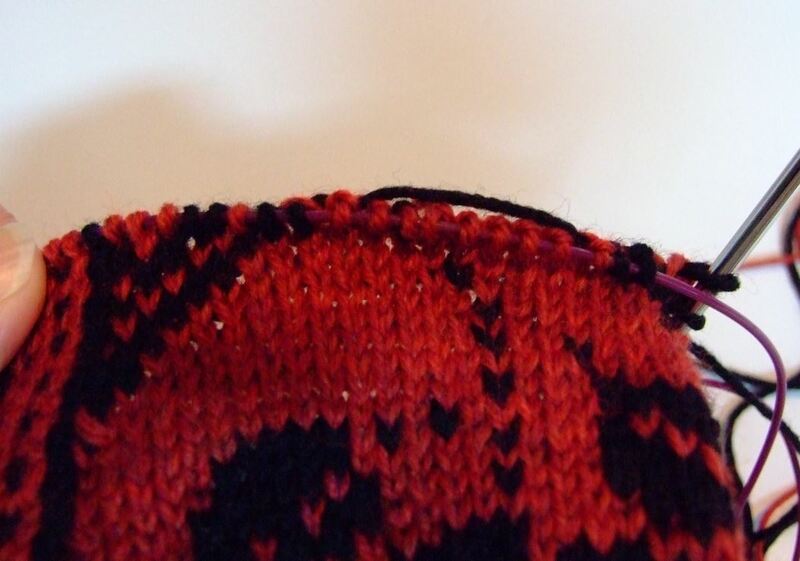 The above photo shows the center stitches I have set up to begin my DK heel. 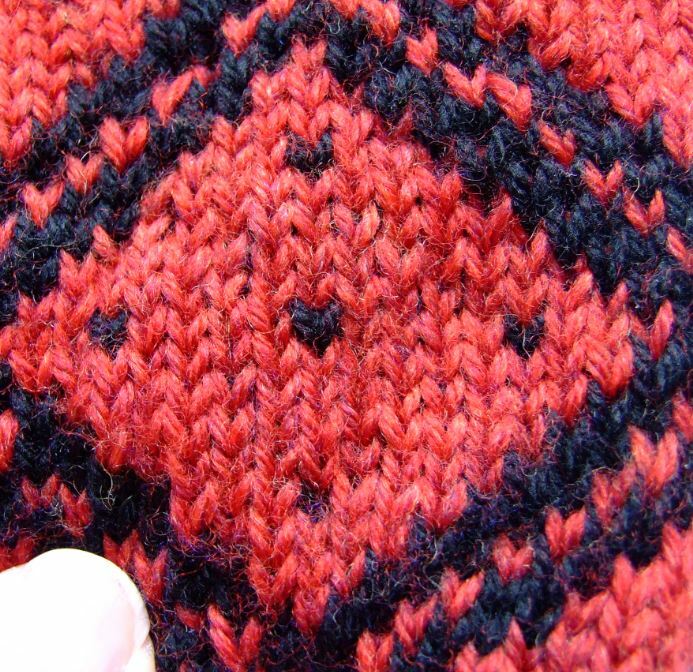 The black stitch border, just to the right of the center stitches is the last stitch of the round. Here is where I broke off my yarns, leaving a 6 inch tail to weave in later. I begin the DK set using 2 new yarns and #1 circular needle( which is 2 sizes smaller than the #3’s I used for the main stocking). These new strands will complete the instep when the heel is finished, and move right on to the toe section, where the process is repeated again. Why? As most patterns have to do a partial round to set up your heel, this method allows you to keep the rounds even, as you will be centering your heel on the sole stitches and when finished you will be able to move right on to the next round of the instep as if you never stopped. 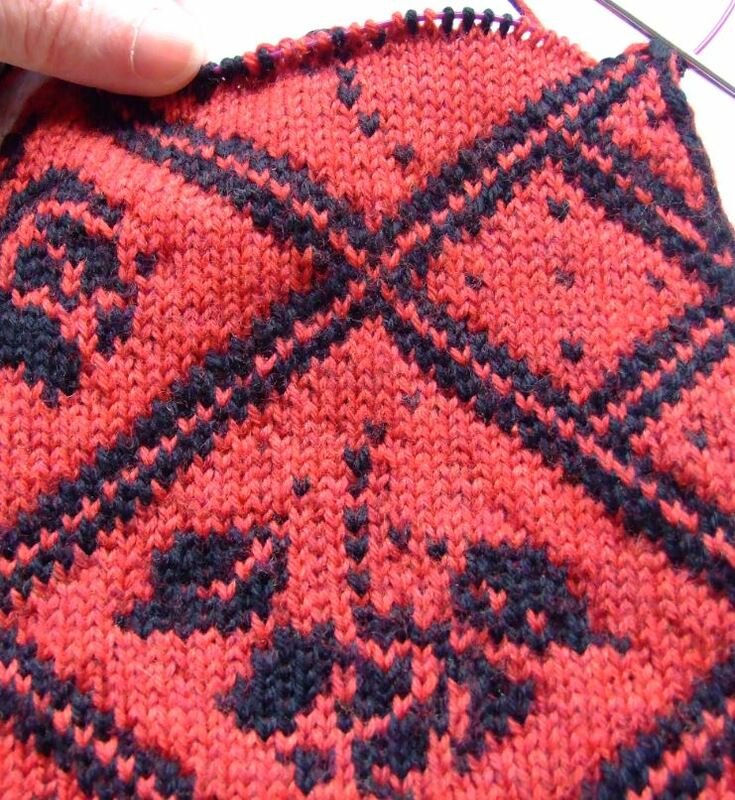 It also doesn’t off set your center stitches as the last round is totally completed. You can also opt for any pattern you like on the sole-I simply used the leg chart.